Last entry we talked about our BK Mikro series. This time around we wanted to tell you a little about our tool monitoring system known as Techna-Check. We developed our signature program in direct response to what we felt was sorely lacking for many manufacturers: a cost-effective solution that would allow machine line managers to monitor tooling on a moment-by-moment basis. Able to fit easily into an electric cabinet, one way that Techna-Check works is by monitoring the spindle power of a given machine. Spindle power is derived by measuring the current and voltage from a spindle or axis motor. A good cutting baseline is measured. Subsequent cuts are then compared to the original, if there’s a discrepancy beyond the baseline limits, Techna-Check will stop the machining process. 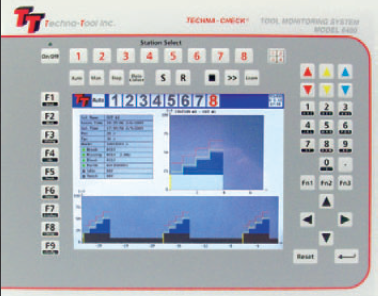 With Techna-Check, you can also analyze the vibrations emitted by any machine in the production stream. Vibration, of course, occurs in any production tool that rotates. Be that as it may, there are still key indicators that a rotating tool is on the verge of damage or breakage. The main indicator is a steady rising hum of the vibration in the machine. Often imperceptible to the human ear until it’s too late, the hum is easily monitored by our Techna-Check program, and then translated visually onto a screen (just as a heart monitor translates a pulse into an onscreen “bump”). If the vibration increases, the program makes note of it, alerting the operator that breakage is about to occur. Techna-Check is then able by itself to shut down the whole machine line if a critical error is about to occur. Our system insures your machine tools have a long uptime, and saves you a considerable number of dollars in terms of repair and replacement of parts. Your brain (your peace of mind) and your bank account both will thank you. This entry was posted in Techna-Check Monitoring. Bookmark the permalink.